Yup, another event from our State Governtment. Everyone of us should register themselves as voter. We should exercise our right. This is our country, our tanah tumpahnya darah kita. Please do not have this kind of mentality – ‘aiyaah, my one tiny vote how to make a differences.”. It is this kind of mentality that will make things worse. Since when that big dreams come from big actions? Big dreams come from accumulation of small right actions. So, we must do our part! I do admit that last time, I too had this kind of mentality. So until now, I still have not register myself as a voter and I have never voted before. After GE12 tsunami, I started to understand more about our nation’s politics and learnt more about how politics affect us regardless whether you are working, doing business, housewife, student and so on. We have to do our part. 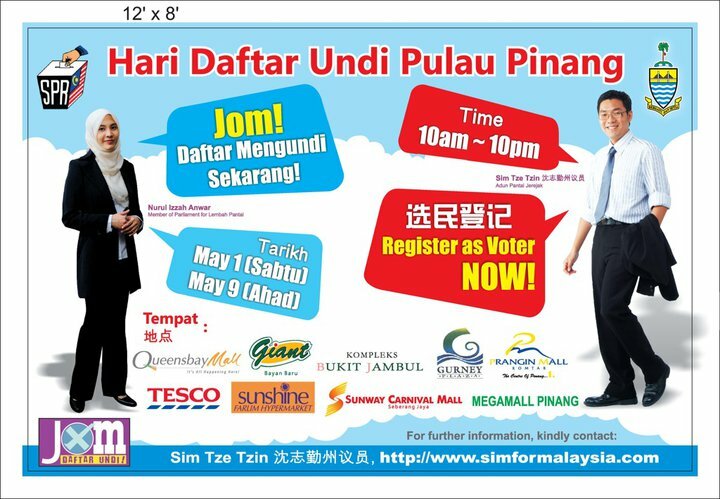 Do register yourself! See you there! I will post about my experience of registering as a voter!